James Starks is back in the mix at RB this week. How much time (i.e., carries) does he see and will he be effective after missing a few weeks? How, if at all, will that affect Eddie Lacy's rhythm in the offense since he's used to 20+ carries the past three weeks? Adam: I think there's still enough to go around in terms of easing Starks into the mix. I expect Lacy to still see 17-22 carries and Starks to maybe get 5-7. With Lacy's production the team has the luxury of bringing him back progressively and utilizing him to spell Lacy including some third down situations. Shane: I think it all depends on Starks' early production and burst. McCarthy will ride the hot hand--he's not impartial to Lacy just because he's been the starter; he's impartial to productivity. The Vikings run defense is one of the worst in the NFL, so I predict Lacy gets around 15 carries and Starks 8-10, with both having success. We might just see 200+ yards rushing in this game from the Packers backfield. Adrian Peterson hasn't had a ton of success this year, but is still top-5 in rushing yards in the NFL. Is there any reason to believe he'll have a breakout game against the Packers? Adam: Christian Ponder has a lot riding on this performance and the idea of him stepping up to try and save his job is a little worrisome. However, the book still reads loading up the box to stop Peterson and dare the Vikings to take shots down the field is the way to go. The Packers seem to realize with the abundance of injuries that game planing and playing assignment sound football is a must to continue winning. I expect the Packers to live up their 1st ranked rush defense billing and hold Peterson under 100 yards. Shane: Peterson is dealing with some lingering injury issues but in divisional play he brings a different level of intensity. If the Packers clog up the middle, expect Minnesota to try screen and short pass plays to get Peterson in the open field. The prospect of any of the Packers linebackers trying to cover AP is very scary. This is how the Packers COULD get burned. The Packers are pretty heavy favorites again this week, but they're playing at the Dome. How will the Vikings keep this contest close? Conversely, how can the Packers run away with a big win? Adam: Rodgers realizes the value of starting fast on the road in this hostile environment. I look for GB to sustain some long drives early and continue their upward trend of efficiency in the red zone. Jumping out to early lead is the best way to neutralize the crowd and limit the amount of touches that Adrian Peterson will have. I hope the injuries continue to leave the Packers hungry and focused to shutout any chance of a letdown. Go Pack Go!! Shane: The only way this one stays close is if the Packers lose the turnover battle. They must play fundamentally sound and the rest will take care of itself. Last year Ponder made some plays down field on the Packers secondary, but with Green Bay's improvement those opportunities will be few and far between. Big plays is how the Packers can open this one up. In each of the last few games the running game has helped open up down field throwing lanes and we'll see that happen in a bigger way Sunday night. I predict Rodgers will connect with both Nelson and Boykin on 40+ yard plays. The Packers are dangerously thin at LB. 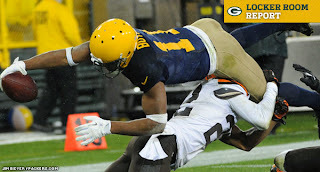 What is the defensive game plan for Sunday's game and can the Packers still get pressure on the QB? Adam: The Packers will have to maintain their gap discipline against the run and mix up their looks with some different blitz packages to try and confuse Brandon Weeden into making mistakes. Luckily, Weeden has proven to be an inexperienced turnover prone passer. The defensive line really needs to step up and free up the young linebackers to get to Weeden. Raji, Pickett and Jolly all understand they need to bring their A game in the trenches for the defense to have success Sunday. I think this is a great match up for Dom Capers to feel his way through utilizing his new inexperienced personnel. The young LBs have great athleticism and if they can be assignment sound, they should be able to limit Cameron's production. A.J. Hawk has played like a pro bowler all season and will be relied on to make some more big plays Sunday. Yes, I said Hawk is a pro bowler, check the tape. Shane: Dom Capers will stick with his game plan from last week and use A.J. Hawk and corner blitzes, from Micah Hyde and Casey Hayward (if he plays) to try and get pressure on Weeden. Capes should play conservative and take his chances giving Weeden time in the pocket to hopefully make terrible decisions. That's what Weeden has done all year, no reason to think that changes this week. Mitch: I believe we still can get pressure on a poor browns offensive line. We will continue to stop the run and make Cleveland beat us down field passing. Who steps up on offense with Cobb out and Jones likely out Sunday? Adam: It's hard to predict where the extra production will come from, but I expect McCarthy and Rodgers to be more synced up on the offensive game plan. McCarthy needs to be flexible in how we approach the game offensively. I'm interested to see how the Browns play the Packers. Are they expecting the Packers to pound the ball with the WR injuries or do they stick to the normal cover 2 shell that many teams run against the Pack. I think they'll gamble and cheat towards the run game daring Rodgers to test his young weapons. If the Packers are patient with the run I think there could be a few big plays from Jermichael Finley and Jarrett Boykin off the play action pass. I've loved what I saw against the Ravens once Green Bay was forced to lineup in more traditional formations. I trust the offensive adaptability of McCarthy and his ability to game plan with what he has. Shane: Jarrett Boykin. In the off-season coaches and media talked up Boykin's growth and potential--it's time for him to step up and show what he can do. Last week was embarrassing and he'll be out to prove something. I predict he catches 6 passes for 85 yards and a TD. The Browns have some talented pass catchers in Josh Gordon and Jordan Cameron. How effective will they be against the Packers defense and what kind of impact will they have on the game? Adam: I think stopping the run and keeping a safety over the top of Gordon will be key factors in limiting the browns offense. Special teams will also play a huge role in the game. Field position will be important for the Packers on both sides of the ball with the injuries. I hope there was a focus in practice regarding special teams coverage because the Browns have broken some long punt returns. The injuries leave the Packers coverage teams shorthanded and vulnerable. McCarthy loves to talk about the three phases of the game and special teams is extra critical in this match up. Shane: I predict either Gordon or Cameron will have a big day. The Packers just don't have the coverage in the middle of the field to shut down both. I predict Cameron goes off for 100+ yards and a TD, matched up on one of the Packers 8th string TEs. It won't be deadly or game-breaking if only one of them go off, but if both do it could be a long day. Mitch: I think Cameron will get his touchdown and 60 yards. Not worried about Gordon. Packs secondary playing well. Adam: I don't expect this to be pretty. The Browns have an underrated defense and nothing comes easy Sunday. Injuries or not the Packers need a win at home against an inferior opponent to keep this train moving in the right direction. I expect Rodgers and McCarthy to rise to the challenge extremely shorthanded. Shane: This will be a grind it out game for sure. Packers win in a close game 17-13.